The moon was formed by a violent, head-on collision between the early Earth and a "planetary embryo" called Theia approximately 100 million years after the Earth formed, UCLA geochemists and colleagues report. Scientists had already known about this high-speed crash, which occurred almost 4.5 billion years ago, but many thought the Earth collided with Theia at an angle of 45 degrees or more — a powerful side-swipe (simulated in this 2012 YouTube video). New evidence reported Jan. 29 in the journal Science substantially strengthens the case for a head-on assault. 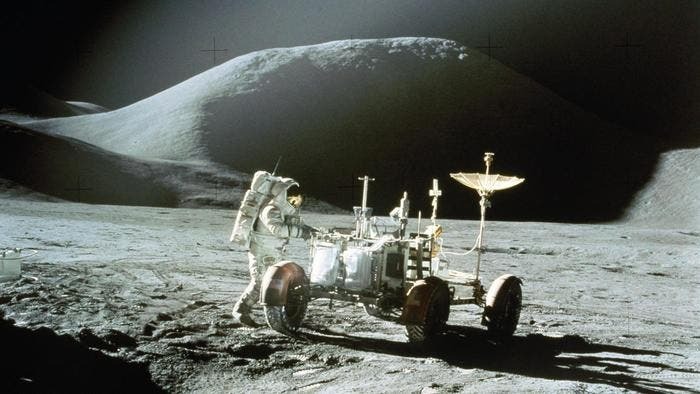 The researchers analyzed seven rocks brought to the Earth from the moon by the Apollo 12, 15 and 17 missions, as well as six volcanic rocks from the Earth's mantle — five from Hawaii and one from Arizona. The key to reconstructing the giant impact was a chemical signature revealed in the rocks' oxygen atoms. (Oxygen makes up 90 percent of rocks' volume and 50 percent of their weight.) More than 99.9 percent of Earth's oxygen is O-16, so called because each atom contains eight protons and eight neutrons. But there also are small quantities of heavier oxygen isotopes: O-17, which have one extra neutron, and O-18, which have two extra neutrons. Earth, Mars and other planetary bodies in our solar system each has a unique ratio of O-17 to O-16 — each one a distinctive "fingerprint." 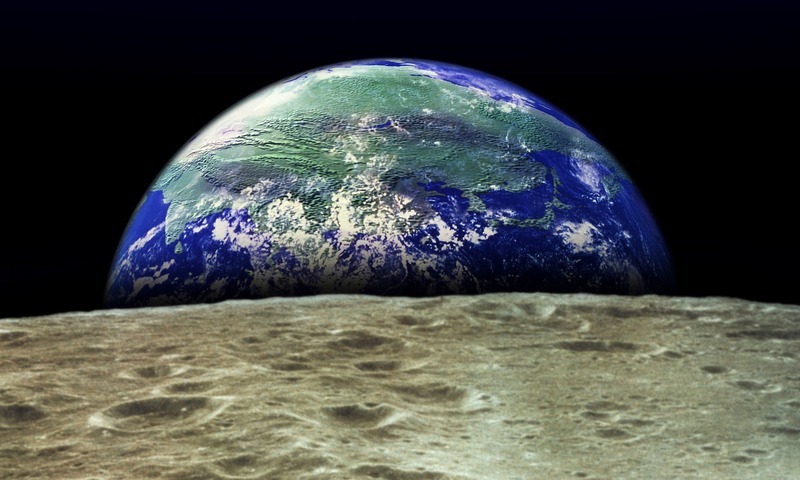 In 2014, a team of German scientists reported in Science that the moon also has its own unique ratio of oxygen isotopes, different from Earth's. The new research finds that is not the case. "We don't see any difference between the Earth's and the moon's oxygen isotopes; they're indistinguishable," said Edward Young, lead author of the new study and a UCLA professor of geochemistry and cosmochemistry. Young's research team used state-of-the-art technology and techniques to make extraordinarily precise and careful measurements, and verified them with UCLA's new mass spectrometer. The fact that oxygen in rocks on the Earth and our moon share chemical signatures was very telling, Young said. Had Earth and Theia collided in a glancing side blow, the vast majority of the moon would have been made mainly of Theia, and the Earth and moon should have different oxygen isotopes. A head-on collision, however, likely would have resulted in similar chemical composition of both Earth and the moon. "Theia was thoroughly mixed into both the Earth and the moon, and evenly dispersed between them," Young said. "This explains why we don't see a different signature of Theia in the moon versus the Earth." Theia, which did not survive the collision (except that it now makes up large parts of Earth and the moon) was growing and probably would have become a planet if the crash had not occurred, Young said. Young and some other scientists believe the planet was approximately the same size as the Earth; others believe it was smaller, perhaps more similar in size to Mars. Another interesting question is whether the collision with Theia removed any water that the early Earth may have contained. After the collision — perhaps tens of millions of year later — small asteroids likely hit the Earth, including ones that may have been rich in water, Young said. Collisions of growing bodies occurred very frequently back then, he said, although Mars avoided large collisions. A head-on collision was initially proposed in 2012 by Matija ?uk, now a research scientist with the SETI Institute, and Sarah Stewart, now a professor at UC Davis; and, separately during the same year by Robin Canup of the Southwest Research Institute. NASA VIDEO: Close-Up of Pluto's Moon Charon –Does It Harbor a Buried Ocean?